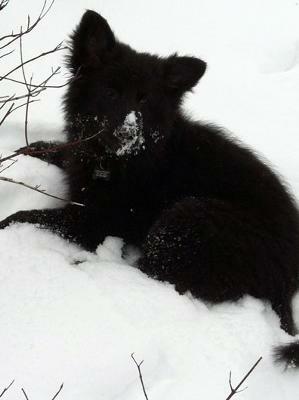 This is McLeod our 3 months old long haired black shepherd. This picture was taken just after he gave himself a face wash! That is one of the cutest black German Shepherd puppy pictures I've seen in a while. McLeod is so handsome and I know you are so proud of him. I don't blame you, I would be too. If he's anything like my German Shepherd puppy I'll bet he is a snow hound too. And probably water too I'll bet. And toys, I'll bet he loves those too right?! Oh Goodness Me - you have a heart breaker on your hands. They are just the most good looking dogs ever. My Jessie - also a long hair is now 3 years & just adorable. The Blacks seem to have the lay back attitude - very easy to train & so adoring.